You may have heard stories of people who receive a 2nd change at life, from doctoring giving a new heart or kidney to people. Or maybe near death experience. I heard other day, this guy was under a truck and the truck was on his head and he was ready to die. He survived because people found him. Maybe like a lot of people, you saw a white light. I heard of that before. People die and they claim they saw a white light. My personal story, last few months, almost got hit by cars, buses and 18 wheelers. God giving me more than 2nd chance lately. I’m not sure where you stand on it, but I can say, Jesus wants to give you a 2nd chance. From Death to Life. Death to Life? Spiritual we are dead. Because of our sin, lying, stealing, murderer or hate, even looking at a woman or a men with lust is a sin. Rebellion against GOD. That results to us going to hell. We must pay for the sin. It’s everlasting separation from GOD. Therefore we are dead from the moment we understand we are sinners and rejected holiness. No one can stand before God and proclaim ourselves righteous, but only each one of us are wicked. Now, Jesus has come and he is offering to turn things around for each person and offer new living true life. Matthew 8:1-17 gives many examples of how Jesus in the flesh gave people a new life. There amazing. The first example is a Men with Leprosy. Jesus touched him and the guy was healed. The 2nd example was a ruler with a daughter that was dying and Jesus spoke and the girl was healed and didn’t die. Jesus heals other people later on. Word spreads and crowds come to him. Today, people still get healed by Jesus. Some Christians have spiritual gift of healing and people get healed. I’ve seen it few times. Now, we understand, God in flesh could do that, he is God. The reason behind doing it is pointing to something. First to fulfill what the prophet said about him. 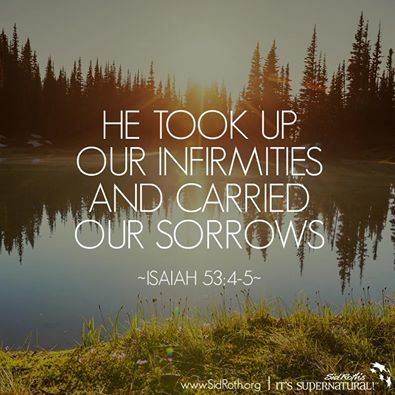 “He took up our infirmities and carry our diseases”, Isaiah 53:4. This was wrote about 500 years before the birth of Jesus. Now, the 2nd reason he did these things is to show Love. of society. You would think Jesus, being God be up with the priest in the temple. He wasn’t. He spoke against the priest and holy people, he sat and spent time with sinful people. He came to give a 2nd chance to the unrighteous. How can you receive New Life? 1) You and I must come to Jesus. The Leprosy and Ruler (Weak and Strong; High and Low both alike) came to Jesus with their request. 2) Ask Jesus, but by Faith. Know and say to yourself, “he will answer me”. Jesus said, “I am willing. Be clean”. Then the men was cured of Leprosy. I and you have a spiritual Leprosy. Sin in our life is eating us alive inside out. By what we say and do. Our rebellion against God is destroying us. Cry out to Jesus today. Don’t wait any longer. You might not be alive tomorrow.